The Massachusetts Beer Distributors Association supports the state's diverse and thriving industry of independent distributors working to ensure consumers enjoy a wide variety of beer brands through a safe, transparent and accountable system. Massachusetts’ economy has significantly benefited from the local beer industry. State beer distributors directly employ thousands of people, and contribute millions of dollars to the federal, state and local tax base. They also are small business owners, civic leaders, parents and philanthropists who are active in their communities. 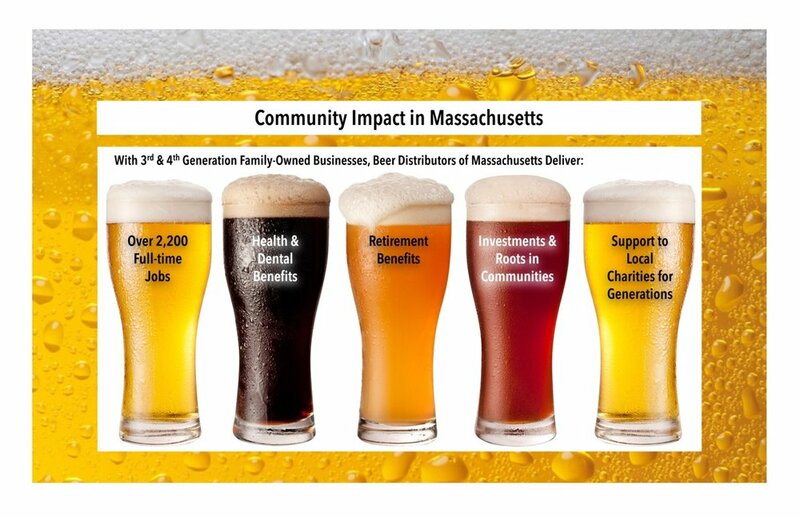 Beer Distributors of Massachusetts play a vital role in working to keep the communities where they live and work safe by promoting responsible consumption and other educational programs. Emerging Breweries & Distributors Growing the Massachusetts Beer Industry. A bill filed by the Beer Distributors of Massachusetts Inc. in the Massachusetts Legislature will give breweries even more choice and flexibility in their relationships with beer distributors. Tell your legislator to support both Massachusetts emerging breweries and the family-run distributors that support the growth of the industry. Support the EMERGING BREWERIES BILL, HD.110/S.468. Learn More, Take Action Today! The partnership between beer distributors and emerging breweries make for powerful success stories. In Massachusetts, Merrimack Valley Distributing and Newburyport Brewing Co. began with a simple connection that has broadened the market for a beloved line of craft brews. Watch this video of a distributor-brewery partnership that, ultimately, benefits beer drinkers! The Beer Distributors of Massachusetts is a full service, professional trade association representing thirteen beer distribution companies in Massachusetts. We support our members through representing our industry on Beacon Hill and being a voice for distributors throughout the Commonwealth. Beer distributors are a critical link in the established and regulated system which includes brewers and importers, distributors, and retailers. Distributors are regulated by the Commonwealth and provide a variety of beer brands to licensed retailers at a great value while protecting the public. Our members serve communities throughout Massachusetts with quality and diverse products, responsible educational programs, and community outreach. Beer distributors of Massachusetts value their role in the state-based system of alcohol regulation that works to keep communities and citizens safe while encouraging healthy competition and a robust marketplace. Thank you for contacting the Beer Distributors of Massachusetts. We will be in touch shortly.